Sarah Greene closed the show last month (April 2011) at Brockton Writers Reading series # 17. Starting out by reading some of her poems, Greene followed by picking up her guitar and singing the night away. One could say Greene sings folk music but after hearing her new CD Toronto Blues— often mistaken for a Blues CD because of the title—you see the ten tracks that make up Greene’s album are a diverse group of songs put together. Whether seeing Greene live or listening to her CD you can feel the emotion she puts into her music. Art is about expression and Greene sings it all out. Good artists know how to relate to people. Toronto Blues is about living in Toronto, or any city, and feeling the different emotions that come with life, and surviving the down times. We all have bad days. Some of us mope around, lay in bed, pray, hit the bar, call a friend, and all that; Greene writes songs about good and bad days and living through them. Love is a constant in Toronto Blues as it’s often intertwined with bad days. Greene sings of being home and brokenhearted, feeling guilty in bed some mornings, and the feelings that often arise when two people become really close friends. Silly Summer Day, a folky track, is one that many have lived. Have you ever liked a friend? Felt the switch from friend love to partner love? Stayed quiet because you didn’t want to ‘ruin’ the friendship? Greene sings of such awkward moments. Why? Because she’s probably been there. True. Sad. Easier said than done. In Johnny, Greene writes of a crush on an older guy who is “much too cool” for her. The song starts out like something you’d hear in the film Dirty Dancing and then turns bluesy with a great sax solo taking over. If Johnny is as sweet as the sound of that sax you can see why Greene is crushing. A bike-ride at night is the cure for Greene’s tough time in It’s A Life. A harmonica lulls the listener as Greene sings of a brokenheart resulting from seeing a guy kiss someone. Tears run down Greene’s face as she moves forward peddling the pain away. Some of the songs in Toronto Blues sound a little too similar. Many are about love and the everyday struggles of life. The best part of the album is last section which is straight up Blues. Following in the tradition of Blues artists that have come before her, Greene invents her very own Blues song: Woodpecker Blues. Greene is no one-woman band. Although she walks around town with a guitar, Toronto Blues is a group effort involving seldom used instruments like stomps, handclaps, and a ukulele. Greene ends the album with the title song. 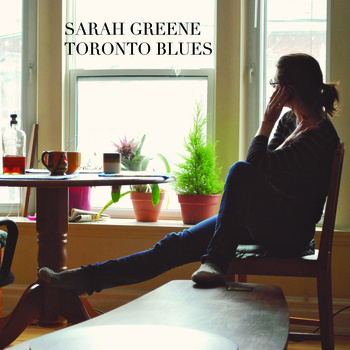 At some point in life we all ‘sing the blues’ in different ways; check out how Sarah Greene does it. This entry was posted in Poetry and tagged "It's A Life" by Sarah Greene, "Johnny" by Sarah Greene, "Silly Summer Day" by Sarah Greene, "Toronto Blues" by Sarah Greene, "Woodpecker Blues" by Sarah Greene, Black Coffee Poet, Brockton Writers 17, https://blackcoffeepoet.com/, Jorge Antonio Vallejos, Sarah Greene. Bookmark the permalink.